I'm sure this has been asked before but.....why does ar57 restrict full auto bolts for the 5.7 but 5.56 full auto bolt are no problem? I guess no one is using an auto sear? Is there even a full auto AR57? Also considering the many issues AR57 owners have been facing including basic quality of AR57s and reliability issues in semi mode one would have to wonder just how poorly or even how badly things could go with a full auto AR57. M16/ M4 carriers are used in many title 1 guns. 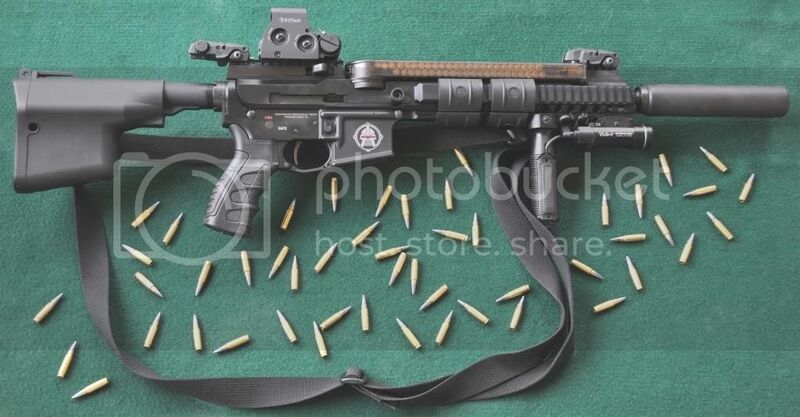 panzermk2 wrote: Also considering the many issues AR57 owners have been facing including basic quality of AR57s and reliability issues in semi mode one would have to wonder just how poorly or even how badly things could go with a full auto AR57. For the record, my AR57 has performed flawlessly - SBR'd and suppressed - no issues. Then again mine is Gen 1... maybe they've take a couple of steps backwards with Gen 2? I would LOVE to try full auto with my Cylon AR57, but alas, my lower is from 2011. Same boat as me, My Excel works great but they have been <profanity> for everyone else. Go figure. First of all, a full auto 5.56 BCG isn't a restricted item. The full length shroud is required to trip the auto sear, but you need an auto trigger pack in the first place to have the sear that requires tripping. Second, someone fill me in, is the AR57 upper just a bolt on part to a standard Mil lower? If so, then no parts in the upper would be restricted, unless the manufacturer refuses to make them. There is absolutely no law against having all the necessary parts in an upper to enable full auto fire, all of the registered and restricted parts would be in the lower. I'm confused by the usage of AR57 and AR15 as suppliers or manufacturers. The AR-15 is just a word, like Kleenex, used to describe AR-15 pattern rifles. Non of these things in our safes are actually AR-15s unless you have some collectible Armalite or maybe Colt from back in the day. I was under the impression that AR-57 was the same thing, an upper for an AR-15 pattern lower that uses P90 magazines and works with the AR trigger group. Is there actually a company called AR-57? First of all, a full auto 5.56 BCG isn't a restricted item. The full length shroud is required to trip the auto sear, but you need an auto trigger pack in the first place to have the sear that requires tripping. And your point is? Second, someone fill me in, is the AR57 upper just a bolt on part to a standard Mil lower? If so, then no parts in the upper would be restricted, unless the manufacturer refuses to make them. It seems the manufacturer thinks so.....that's the reason I satrted this thread? There is absolutely no law against having all the necessary parts in an upper to enable full auto fire, all of the registered and restricted parts would be in the lower. Again your point? This thread never questions that? Not selling FA bolt carriers without documentation may be a choice of theirs, or it may be a Washington thing. All I know is Oly is the same way. FWIW, I found 57centers customer support to be excellent. My ar57 upper runs well full auto with FN mags. With the mags that came with it, not so much. I have a 12" Gen 2 AR57 that has performed flawlessly. I have it on a lower that I pieced together myself. As for the full auto bolt carrier the only thing that comes to mind is that here in Washington it's illegal to have a full auto unless you have a FFL for it or are Gov/Leo.